RT – March 26, 2018: The highly anticipated yuan-backed crude oil futures have been launched in Shanghai. China is the world’s biggest oil consumer, with eyes on rival benchmarks Brent and WTI as well as the US currency. Trading of the new oil futures contracts for September settlement started on the Shanghai International Energy Exchange at 440.20 yuan ($69.70) per barrel, reports Chinese daily the South China Morning Post. Some 18,540 lots have reportedly been sold and purchased so far. And long-awaited step has evoked a surge in global prices for oil with Brent Crude soaring to $71 a barrel for the first time since 2015. RT – April 7, 2018: Max Keiser: We have been waiting on this for a long time, because we are talking about the (US) dollar. The fact that it is the world’s reserve currency, countries are tired of funding America’s wars because everything has to be traded in dollars including oil. If you buy oil, you’ve got to buy dollars first and that means America gets a commission and use that money to wage wars all over the world and people are tired of it. They are tired of war and they do not want to subsidize war anymore. So China says, here’s the weak point, it’s this dollar. We are going to introduce the Petro-yuan and we are going to takeover the pricing of oil. SPUTNIKNEWS – April 24, 2018: Iran has decided to replace the dollar with the euro in foreign trade, thus joining an informal club of states, seeking to reduce reliance on the US currency in the oil industry. The dollar in Iran has no place in our transactions today, with traders preferring alternative currencies for their transactions. There’s no longer any need to continue using dollar-based invoices,” said Mehdi Kasraeipour, the Central Bank’s Director of Foreign Exchange Rules and Policies Affairs. This is a politically motivated decision. Transactions in dollars go through American banks, which pose certain risks to Iran. There are no such risks in transactions in euros,“ said Alexander Razuvaev, director of the analytical department at Alpari. “A national currency must be easily convertible and be on the list of reserve currencies in order to become an alternative to dollar in energy transactions globally. China, which has launched yuan-based oil futures contracts, is the closest to the goal,” Kalachev said. RT – April 20, 2018: Iran has announced it’s dumping the dollar in favour of the euro for official financial reporting. That will make it the latest nation to limit use of US money. RT – April 1, 2018: In its efforts to make its currency more international and break the global dominance of the US dollar, China is in the early stages of preparing to pay for oil imports in yuan, sources told Reuters. RT – April 7, 2018: Yuan-backed oil futures can shatter the US dollar dominance on the crude market, according to experts polled by RT. However, the greenback will not give up the top spot easily. “The question number one is whether China will be able to make the oil market its demand market, and not the oil supply market traded in dollars, which it is now,” Vladimir Rozhankovsky, Global FX Investment analyst, told RT. China has recently overtaken the US as the world’s number one oil buyer. “The question number two is trade wars. If the world trade enters into a death spiral of reciprocal economic sanctions, keeping oil trade in dollars will be a matter of strategic importance, or a matter of survival for the US,” the analyst added. As a result, Washington can deliberately undermine the image of the petro-yuan by attacking Chinese stock, which could result in the devaluation of the yuan, making Chinese oil futures less attractive, Rozhankovsky said. RT – March 27, 2018: China is the world’s biggest crude consumer and buys most of its oil from Russia. However, most settlements are still in US dollars. 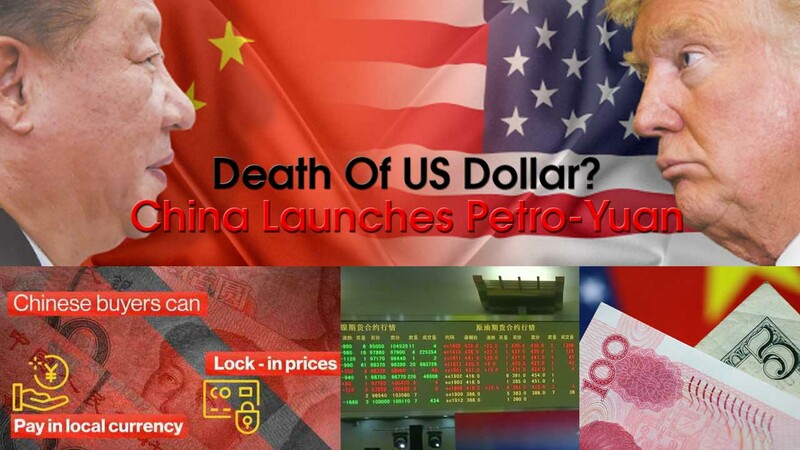 The launch of the petro-yuan now allows Moscow and Beijing to use national currencies instead. After Monday’s launch of the yuan-backed oil futures in Shanghai, there have been negotiation between Russia and China on mutual promotion of oil futures in national currencies, RIA Novosti reported. In 2016, the St. Petersburg exchange in Russia launched Urals oil futures in the Russian ruble, and support from China could prop up Russian crude futures. RT – March 31, 2018: Muammar Gaddafi wanted to shatter the dominance of the greenback in the Middle East by introducing gold-backed dinar, but failed. China has a chance to finish what he started, one industry expert has told RT. “Ideas related to oil trade in currencies other than the dollar arose more than once. Some of them were severely suppressed by the United States, one example is Muammar Gaddafi, who proposed the introduction of a regional currency gold dinar and trading oil in the Middle East in this currency,” Aleksandr Egorov, foreign exchange strategist at TeleTrade, told RT. SPUTNIKNEWS – March 30, 2018: While the yuan is displaying record gains against the United States dollar, it appears that the Chinese government is seeking to find an alternative to using the American currency in payments for imported crude oil. Gradually strengthening against the US dollar this week, the Chinese yuan is expected to post its”“biggest quarterly gain in a decade,” The Business Times newspaper reports. TASS – March 27, 2018: China’s launch of trading in the yuan-denominated oil futures on the Shanghai International Energy Exchange (INE) has become a positive point for development of the oil market in general, Vice President of the Russian Chamber of Commerce and Industry Vladimir Padalko told TASS on Tuesday. “The oil futures trading start on the exchange in China is an expected and, from our point of view, a positive point in development of the oil market at large. China is the largest oil consumer and one need not to be guided by prices set in points of sale in other states because consumption is here. Almost everyone focuses on oil trading in China,” Padalko said. Trading in the yuan-denominated oil futures were launched on the Shanghai International Energy Exchange (INE) on March 26. The contract amount is 1,000 barrels, the Exchange reports. The minimal price increment is 0.1 yuan per barrel. Deliveries will be from ports of Oman, Qatar, Yemen, Iraq (Basra) and East China. Supplied oil will be located in seven storages situated in coastal areas of the China provinces of Zhejiang, Shandong, Guangdong, Liaoning, and in the Shanghai deep-water port. SPUTNIKNEWS – March 28, 2018: China, the world’s largest oil importer, has launched its first ever yuan-denominated oil futures on the Shanghai International Energy Exchange this week. Observers have pointed out that the crude futures could emerge as a new benchmark, providing Beijing with extra pricing power and helping with the internalization of the yuan. Sputnik discussed the significance of China’s new futures with Bill Holter, a US precious metals broker and analyst. Sputnik: In your view, how significant are these contracts launched by China? What impact will they have on the oil market? Bill Holter: China watch is extremely important because now they are the largest importer in the world and whatever is settled in yuan is not settled in dollars, so that’s going to create less demand for dollars. Sputnik: So what do you think, is this going to affect the price of the yuan going forward and the price of the dollar? Bill Holter: I think it will obviously impact the price of the dollar, the dollar has been supported literally by the energy complex worldwide and this is obviously going to create less demand for the dollar which should create lower price, lower value and it will create more demand for the yuan simply because countries that want to settle in yuan will have to sell their currency and purchase yuan so I think this will strengthen the yuan. Alex Jones: I’m Off The Trump Train!